Recreational fishermen in the nearshore waters off the coast of Port Mansfield, Texas, now have almost five times the amount of habitat to fish. 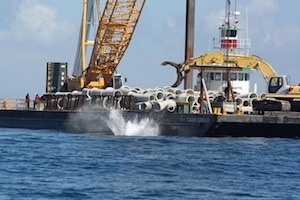 The Port Mansfield artificial reef expansion is a major infusion of hard structure to an artificial reel located within eight miles of the Port Mansfield Jetties will help attract more fish, and more anglers to the area. The habitat program of the Texas chapter of the Coastal Conservation Association, Habitat Today for Fish Tomorrow (HTFT) teamed up with Texas Parks & Wildlife Department’s (TPWD) Artificial Reef Program and Alamo Concrete Products to further enhance the existing Port Mansfield nearshore reef with more than 4,000 concrete culverts. CCA Texas contributed $50,000 toward the total cost of about $537,000 to expand the existing reef, which already held an old tug boat and about 800 culverts. The expanded reef will provide additional habitat for many species of fish and marine life, including red snapper. The Port Mansfield reef is the second major reefing project undertaken by HTFT. In August 2010, more than 250 tons of concrete and granite splashed down on the Vancouver reef site off the coast of Freeport, and a new reefing project is planned for a third site off the coast between Matagorda and Sargent. To date, CCA Texas has committed more than $200,000 to creating nearshore artificial reefs in Texas waters. The state’s Artificial Reefing Program’s nearshore and public reefing portion has been in existence since 2006 and aims to establish a 160-acre site at each major port in Texas. Sites currently exist at Port Isabel, Port Mansfield, Packery Channel, Port Aransas, Matagorda and Freeport. These nearshore sites allow the general public to place reefing materials within those areas, as long as those efforts conform to the guidelines of the program and have prior approval from the state.